To accomplish the challenging target of an electric-only fleet by 2030, India must start by welcoming the change to electric buses, says Pintu Saini, Project Officer for Electric Vehicle Initiative at Urban Mass Transit Company (UMTC). India is in the process of tackling its ambitious objective of having a 100 per cent zero-emissions, electric vehicle fleet by 2030, as envisaged by NITI Aayog. Consequently, experiments on the operational feasibility of all vehicle types, including buses, cars, two-wheelers, rickshaws, taxis and goods vehicles, are beginning. The Indian government understood the environmental need to switch to electric vehicles and to ensure it is a success, a number of initiatives are being implemented. Faster Adoption and Manufacturing of (Hybrid) and Electric Vehicles (FAME Scheme) is one of said initiatives. FAME provides subsidies as a financial incentive to buyers of electric vehicles. The scheme allocated approximately INR155 crore for demand incentives in 2015-2016 and around INR340 crores between 2016-2017. As a result, each mode of transport has experienced some acceleration towards electrification. However, this growth is not the same for all modes. For instance, public transport and paratransit modes have seen a higher growth rate in shifting to electrification compared to private vehicles. Buses are experiencing perhaps the most aggressive efforts from stakeholders in terms of successful electrification, and it’s been this way since 2014, when the first electric bus trial started in Bangalore. Figure 1 shows a compilation of all efforts made over the years by different public transport authorities to implement electric buses into their services. Even though most were in the form of trials, some led to the adoption of electric buses in regular operations. Consequently, Himachal Road Transport Corporation (HRTC) and Bombay Electric Supply & Transport (BEST) together acquired 29 electric buses for regular operation, with HRTC purchasing 25 buses and BEST four. This was supported by Indian government subsidies, which further attracted other authorities to opt for electric buses. The trials from 2014 onwards, and adoption of some buses for regular operation by 2017, led to floating the tender for 530 buses in 2018. These buses will be deployed in 10 cities in 2018, as identified by Department of Heavy Industries (DHI) based on city population. 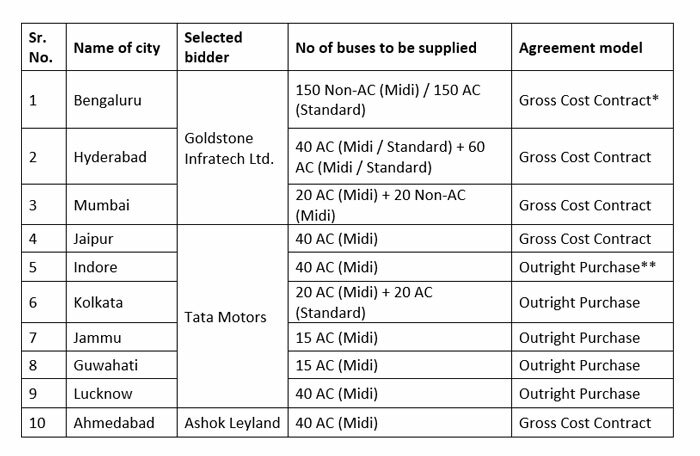 Ten public transit agencies, listed below, floated tenders for electric buses which saw aggressive participation by different bus manufacturers and operators. Eight local bus manufacturers or operators, who partnered with international partners for buses, participated in the tender. The efforts by public transport agencies and price bidding by bus manufacturers and operators have opened up many avenues for mass adoption of electric buses in Indian cities. The capital, Delhi, is in the process of floating a tender for 700 electric buses- the largest tender so far. This reflects a very high growth rate for the adoption of electric buses. In 2017, there were only 29 buses acquired for regular operation. In 2018, as per the current status, around 530 buses will be operated in different cities – an increase of approximately 1,800 percent. This shows an increment of approximately 1800 per cent. If Delhi is also able to procure its 700 buses, the increase in electric buses over the last year will be nearer 4100 per cent. This growth rate, should it continue, will make it easier to achieve the target set by NITI Aayog and the Central Government. At present, the buses are not manufactured in India, only assembled there after certain parts have been imported from other countries. The battery is the main imported component and this leads to high procurement costs. In comparison to conventional CNG or diesel buses, electric buses are very costly. 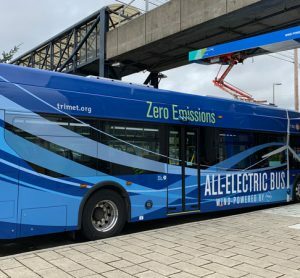 The cost of an electric bus available in the Indian market is typically three to four times the price of a CNG or diesel bus. The high cost is due to imported technology and the cost of battery manufacturing mechanisms. Most of the public transit agencies in India are operating at a loss. This raises a big challenge regarding the operational viability of electric buses if the existing vehicles are already too costly. Achieving operational feasibility after taking on costly buses is another big challenge for public transport authorities. These additional costs and operational losses demand an immediate need to explore alternate funding mechanisms/options and subsidies from the government and other players. 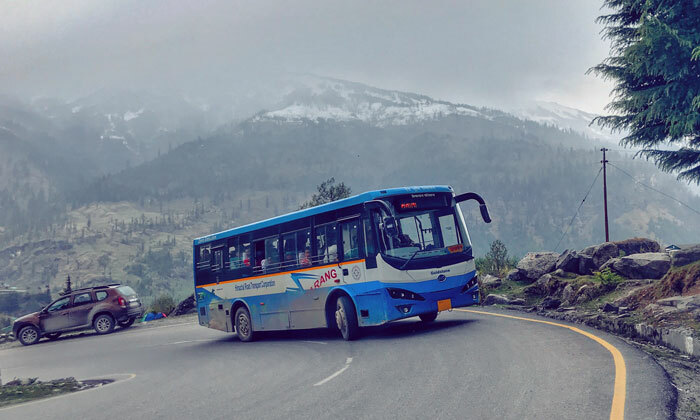 Present subsidies like FAME are over the capital costs, however due to operational losses, alternate funding options or other innovative practices of operation are necessary for these buses to become operationally feasible. There are certain regulations that focus on the adoption process of electric buses and sustainability. Regulations related to bus manufacturing, localisation of components if imported, partnerships/JVs between local and international partners, regulations over battery specification and the performance and disposal of batteries all have to be formulated. Once formulated, they must be strictly implemented by the concerned authorities for the sake of sustainable adoption of electric buses in the Indian market. These buses, especially Indian models, have provide a lower kilometer range from one charge. However, this is not a big challenge anymore as international partners are able to offer satisfactory ranges. 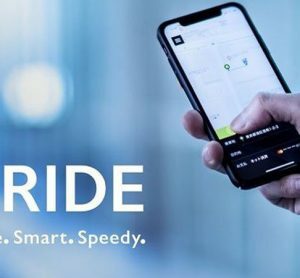 For example, buses from Goldstone, who are in a partnership with Chinese manufacturer BYD, offer a driving range of approximately 250km from one charge, which satisfies the requirements of any bus operating agency. Delhi buses, for instance, only cover around 200km per day. Longer charging durations sometimes hamper the operational hours and can affect the productivity. This is easily solved with the adoption of fast chargers or buses with high drive range. Properly distributed charging stations across a city or region can solve the drive range issues. However, to properly distribute the charging stations is another challenge. The distribution needs to consider a variety of factors, including population density and areas of attraction. 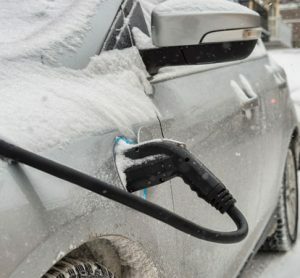 Another challenge is to decide how to mix fast chargers and long duration chargers but once determined, this can help prevent the loss of operational hours. 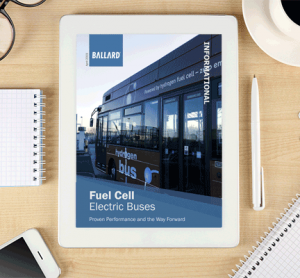 In the last few years, the adoption of electric buses has rapidly increased and, as a result, many public transport authorities are moving towards electrification. The efforts of public transport authorities, bus manufacturers and operators are setting an example to choose cleaner technologies. This encourages the public to use such sustainable technologies instead of private vehicles. The increasing number of electric buses is also helping manufacturers and operators to strengthen their presence in other parts of the electric vehicle market, for example with regards to other electrified modes. Planning agencies, bus manufacturers and operators are now aware of different funding mechanisms and subsidies that could be available and are experienced in the investment and marketing procedures. The swift progress in adopting electric buses in India is paving the pathway for electrification across other modes. 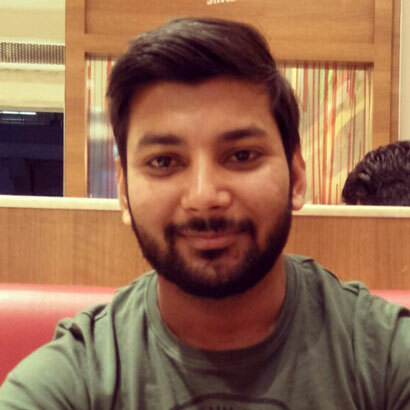 Pintu Saini, Project Officer for Electric Vehicle Initiative at Urban Mass Transit Company (UMTC) holds a Master’s degree in Transport Planning from the School of Planning and Architecture, New Delhi. Before joining UMTC, he was a Research Associate in the Transport Planning Department of School of Planning and Architecture. 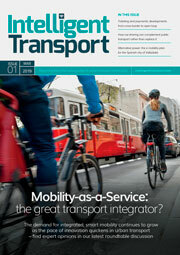 His sole interest lies in the field of sustainable mobility, electric vehicles, cleaner fuels and public transport. Hi Pintu Saini, it’s very informative post on Electric Buses. Electric buses are really the future of Indian transportation as they are emission free & eco-friendly.To reduce overall pollution & fuel usage, Indian Government needs to bring Electric buses for public transport in the near-future. Hi Pintu Saini, this in fact is a very comprehensive piece of information i had read so far. Many thanks to your effort. Our Company a EV buses maker with 100% vertical integration from Product conceptual design to complete vehicle on the road. Do drop me a line so that we can further roll out our discussion.